杨孝群, 李忠. 微生物碳酸盐岩沉积学研究进展——基于第33届国际沉积学会议的综述[J]. 沉积学报, 2018, 36(4): 639-650. YANG XiaoQun, LI Zhong. Research Progress in Sedimentology of Microbial Carbonate Rocks: A review based on the 33rd International Sedimentological Congress[J]. ACTA SEDIMENTOLOGICA SINCA, 2018, 36(4): 639-650. Abstract: The 33rd International Sedimentological Congress was held in Toulouse, France from 9th to 12th, October, 2017, continuously concerning on the topics of microbial carbonate rocks. Based on the summarizing outcome of the conference combined with related domestic and international literatures in recent years and also field investigations on modern microbial carbonate sediments, some research progress and hot spots were investigated and discussed for microbial carbonate sedimentology in this paper. The primarily concerned topics include the following four fields:1) Microbial mat mineralization products and sequences, of which the mineralized products include calcite (low Mg, high Mg, ultra high Mg), aragonite, carbonates containing iron, manganese and calcium, products of magnesium-silicon and pyrite. The mineralization sequences are diverse. 2) Elemental records of the microbial carbonate, in which carbon, oxygen, nitrogen, phosphorus, sulfur, iron, silicon and arsenic may retain the information about the microbial sedimentary carbonate and early diagenesis. 3) The structures mechanism and their significance for the microorganism carbonate rocks such as laminates and clots. 4) the sedimentary environments of microbial carbonates. It is considered that the stromatolite, clot rock and other microbial carbonate rocks are mostly developed in the tidal flat environment, especially the shallow subtidal zone and the upper layers of stromatolitic limestone and clotting rocks. According to the internationally developing characteristics of microbial carbonate sedimentology, the research trend in related fields in China is further discussed in this paper. It is necessary to strengthen the research on the current microbial carbonate sediments and the diagenesis of ancient microbial carbonate rocks. Riding R. Classification of microbial carbonates[M]//Riding R. Calcareous algae and stromatolites. Berlin: Springer, 1991: 21-51. Warusavitharana C, Parcell W C. Sedimentary features, occurrence and cyclicity of microbialite facies in the Roubidoux and Jefferson City Formations of Missouri and Kansas[J]. AAPG Bulletin, 2013, 97(97): 1849-1870. Banfield J F, Nealson K H. Geomicrobiology:interaction between microbes and minerals, reviews in mineralogy and geochemistry[M]. Washington, DC: Mineralogical Society of America, 1997. Dove P M, De Yoreo J J, and Weiner S. (Eds). Biomineralization: Reviews in Mineralogy and Geochemistry[M]. Washington, Mineralogical Society of America and the Geochemical Society, Volume 54. 2003. Tucker M, Perri E, Slowakiewicz M, et al. Mineral precipitates in modern microbial mats: crystallites, spheroids, bacteria and viruses[C]//Proceedings of the 33rd IAS international meeting of sedimentology. Toulouse: IMS, 2017. Pace A, Bourillot R, Bouton A, et al. 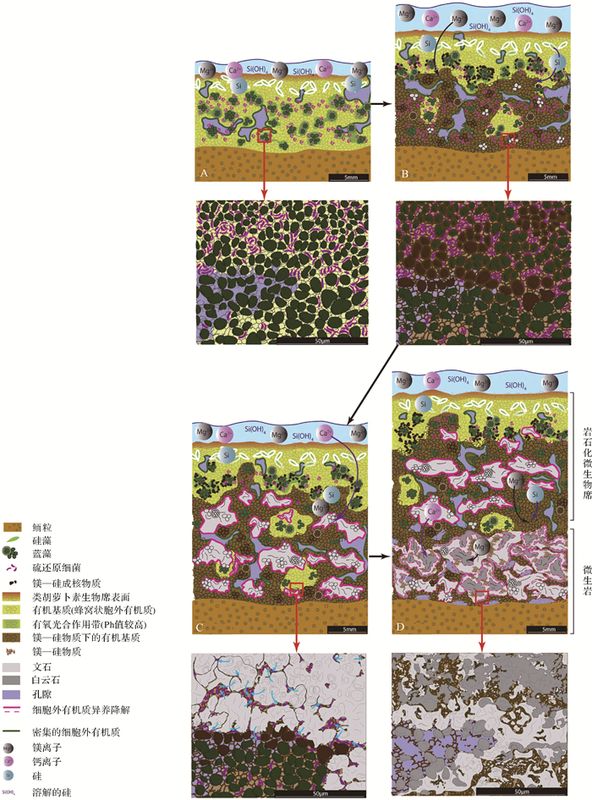 Initiation of Stromatolite Formation at the interface of oxygenic-anoxygenic phoyosynthesis[C]//Proceedings of the 33rd IAS international meeting of sedimentology. Toulouse: IMS, 2017. Merz-Preiß M. Calcification in cyanobacteria[M]//Riding R E, Awramik S M. Microbial sediments. Berlin: Springer, 2000: 50-56. Pentecost A, Riding R. Calcification in cyanobacteria[M]//Leadbeater B S C, Riding R. Biomineralization in lower plants and animals. Oxford: Oxford University Press, 1986, 30: 73-90. Brand U, Veizer J. Chemical diagenesis of a multicomponent carbonate system-1:trace elements[J]. Journal of Sedimentary Research, 1980, 50(4): 1219-1236. Webb G E, Kamber B S. Trace element geochemistry as a tool for interpreting microbialites[M]//Golding S D, Glikson M. Earliest life on earth: habitats, environments and methods of detection. New York: Springer, 2011: 127-170. Azmy K, Brand U, Sylvester P, et al. Biogenic and abiogenic low-Mg calcite (bLMC and aLMC):evaluation of seawater-REE composition, water masses and carbonate diagenesis[J]. Chemical Geology, 2011, 280(1/2): 180-190. Hayes J M, Waldbauer J R. The carbon cycle and associated redox processes through time[J]. Philosophical Transactions of the Royal Society B, 2006, 631(1470): 931-950. Dong H L, Jaisi D P, Kim J, et al. Microbe-clay mineral interactions[J]. American Mineralogist, 2009, 94(11/12): 1505-1519. Yin H F, Huang S J, Zhang K X, et al. The effects of volcanism on the Permo-Triassic mass extinction in South China[M]//Sweet W C, Yang Z Y, Dickins J M, et al. Permo-triassic events in the eastern Tethys. Cambridge: Cambridge University Press, 1992: 146-157. Quijada I E, Cuadrado D G, Maisano L, et al. Carbonate precipitation in microbial mats developed in a siliciclastic coastal environment of N Patagonia (Argentina)[C]//Proceedings of the 33rd IAS international meeting of sedimentology. Toulouse: IMS, 2017. Martìn-Bello L, Arenas C, Alonsozarza A M, et al. Lacustrine stromatolite lamination of the miocene in the sierra de alcubierre(Ebro Basin, Spain)[C]//Proceedings of the 33rd IAS international meeting of sedimentology. Toulouse: IMS, 2017. Konishi Y, Prince J, Knott B. The fauna of thrombolitic microbialites, Lake Clifton, Western Australia[J]. Hydrobiologia, 2001, 457(3): 39-47. Moore L S, Burne R V. The modern thrombolites of lake clifton, western Australia[M]//Bertrand-Sarfati J, Monty C. Phanerozoic stromatolites Ⅱ. Dordrecht: Springer, 1994: 3-29. Diaz M R, Eberli G, Phillips B, et al. Ooids: the unrecognized microbialites[C]//Proceedings of the 33rd IAS international meeting of sedimentology. Toulouse: IMS, 2017. Aubineau J, El Albani A, Meunier A, et al. Unusual Structural Diversity of Mat-Related Structures and their implications for the Francevillian Biota (FB2 Formation, 2. 1 Ga, Gabon)[C]//Proceedings of the 33nd IAS meeting of sedimentology. Toulouse: IMS, 2017. Hamon Y, Rohais S, Deschamps R, et al. Characterization and distribution of the microbialites within lacustrine series: the example of the maastrichtian-danian yacoraite FM, Salta Basin, Argentina[C]//Proceedings of the 33nd IAS meeting of sedimentology. Toulouse: IMS, 2017. Marangon A, Gattolin G, Porta G D, et al. The Latemar:a flat-topped, steep fronted platform dominated by microbialites and synsedimentary cements[J]. Sedimentary Geology, 2011, 240(3/4): 97-114. Kenter J A M, Harris P M, Porta G D. Steep microbial boundstone-dominated platform margins-examples and implications[J]. Sedimentary Geology, 2005, 178(1/2): 5-30. Braga J, Sola F, Sælen G. Patchy Distribution of factory facies in late Miocene nearshore mixed carbonate-terrigenous deposits in Sierra De Gádor, Almeria, SE Spain[C]//Proceedings of the 33rd IAS international meeting of sedimentology. Toulouse: IMS, 2017. Wood R. What has controlled carbonate mineralogy through geological time? [C]//Proceedings of the 33rd IAS international meeting of sedimentology. Toulouse: IMS, 2017. Riding R, Fan J S. Ordovician calcified algae and cyanobacteria, northern Tarim Basin subsurface, China[J]. Palaeontology, 2010, 44(4): 783-810.